The isthmus cells are neural plate cells located at the point where the expression of the more rostral Otx2 and the more caudal Gbx2 transcription factors coincide. They serve as an early organizer of the neural tube and generate the midbrain-hindbrain boundary (MHB). This boundary is roughly positioned during late gastrulation and is progressively refined during early somitogenesis. 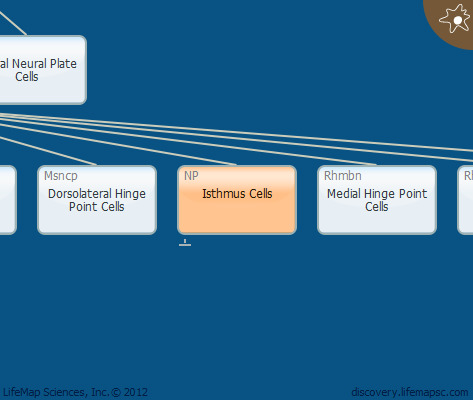 The earliest stage of isthmus cell activity is not precisely known. A fuzzy Gbx2-Otx2 boundary already exists on E7.5, but becomes well-defined and functional only on E9.5.